How To Make An Affordable Website for $300 or less! DIY Affordable Website in under an hour starts…. now! What you will learn today is how you can quickly build an affordable website that looks professional and costs less than $300. How is this different from WiX or other similar website builders? Build and customize your website and leave room for scaling! It’s a small investment to get your website online and this tutorial is so easy that the most technically challenged individuals have been able to get their website up and running referring to these steps. When it really comes down to it, if you’re in a rush to get your website up, the domain name isn’t super important because you can always change to a new one later for a small investment. 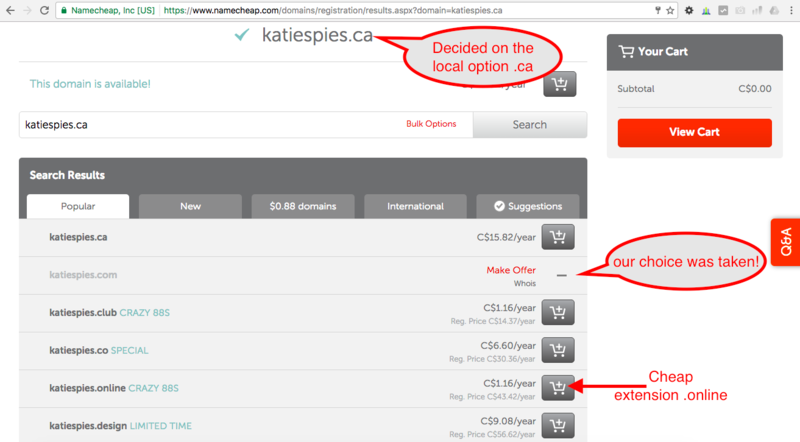 If you want a GREAT DEAL on your domain name, visit Namecheap.com and go with one of the less popular extensions like katiespies.online or katiespies.website. You’ll be able to steal ones of those for under $2/year, um yeah! Need help? Check out my tutorial on How To Register A Domain Name in 10 Minutes or Less. When it comes to website hosting most people have no idea what it is or even that it is required in order to have a functioning website. So what is website hosting? All of the files, images, videos, emails and code for a website must be hosted or ‘stored’ somewhere on the internet so that everyone can see it. Hosting computers are only different from your computer in that they are always on and always online, so anyone around the world can view the website 24-7-365. Hosting is the largest cost to your affordable website, but it’s the most important aspect so invest in a good one! For the quick website setup we are doing today, I recommend HostGator’s WordPress hosting package. They will set up the “Platform” we will use and discuss in the section below, they promise your website will work 99.9% of the time, and from my experience their 24/7 technical support is bang on! 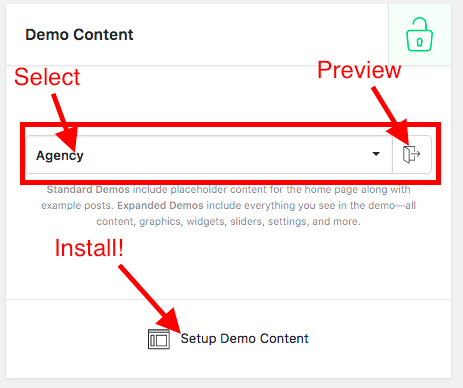 For those of you purchasing the HostGator Baby Plan, you’ll probably want to follow my tutorial on Setting Up WordPress before you continue with the rest of this…. I’ll wait…. Cool you’ve made it more than half-way! 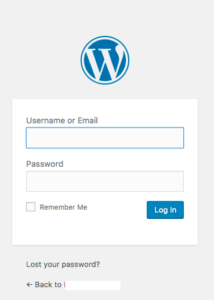 So now that you’ve got your WordPress platform set up, login bro! In the same upper area, you will see the blue “Upload Theme” button. 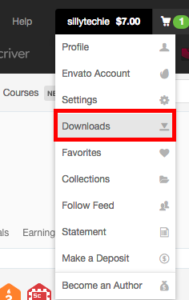 Click the button to reveal an upload file field directly below! 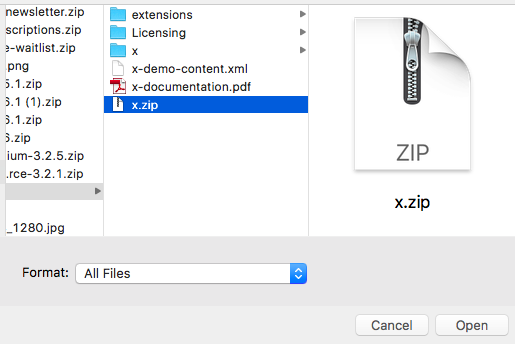 Here’s where you will need to know where you downloaded your x-theme installation file. Click “Choose file” browse your computer for the file you downloaded from Theme Forest …. OR, what I like to do is drag and drop the file into the “choose file” field. No searching required since I usually have the file window open on the side. Then click INSTALL NOW! You’ll have to be patient here while it loads…. and you’ll know when it’s done because you will see the progress screen and then you’ll see it say Theme installed successfully! What are you waiting for? Click “activate”! If you are looking to do some major customizations, you will want to set up a child theme. What is a child theme? It’s a theme that piggy-backs off the mother theme. 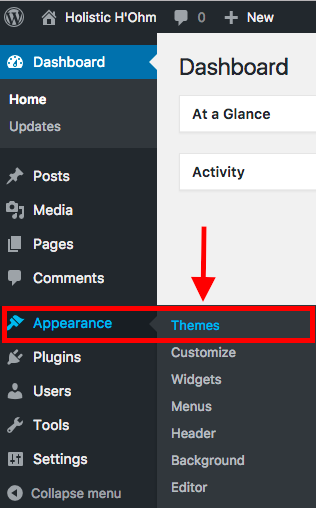 Why do we use child themes? Because the child will take all of the style, functions of the mother but will allow custom modifications that the mother will not overwrite when an automatic update is done. Read more about that HERE: How to Setup a Child Theme. If $500 is still in your ‘affordable website’ range, then hire a developer on Fiverr to help you with some of your modifications. Most of them charge low rates and will do the work in 24 hours or less. 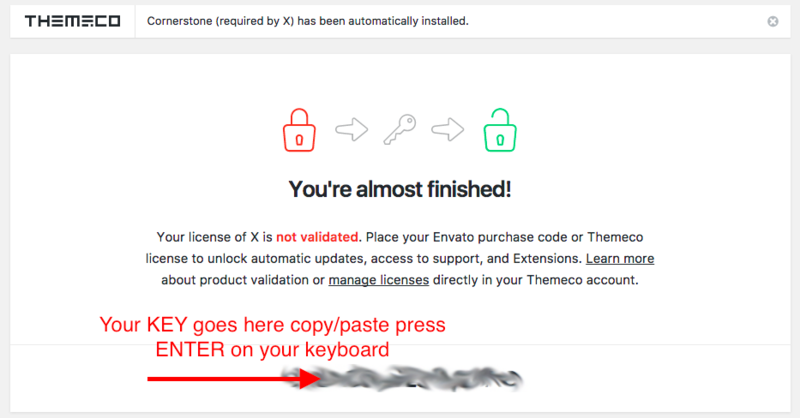 Enter the license key that you downloaded when you downloaded the theme. My suggestion is Copy/Paste. Then press “ENTER” on your KEYBOARD! Boom! You’re now activated. You should now be able to see below, that you can start building your website right away! So if you’re not hugely concerned about the design at this moment and you just want to get your name, company or organization out here, choose one of the pre-loaded templates. They look great, they’re awesome for mobile devices and all you need to do is fill in the blanks with your information. Filling in the information is easy. Use the Cornerstone drag and drop editor. How is this different from WiX or those other DIY editors? Cornerstone editor specifically offers additional functionality for developers or those individuals wishing to fully customize their webpages. You don’t HAVE to use it, but it’s there for you to use and even better, this editor writes your website in VALIDATED code! Now you will have an affordable website AND you will know how to change, update and manipulate it. DON’T FORGET TO PRESS SAVE!!! — no matter what you’re doing, always remember to press save. It’s SO important because your time is money and lost time makes for a less affordable website. ANSWERED: Why Doesn’t My 4G Work On My Phone? Loyal Followers ONLY - Get the latest tips, tricks & hacks right to your mailbox!